The Straphangers unveiled the city’s slowest bus. You’ll never believe what happens next. As part of their annual ritual highlighting just how slow and unreliable our city’s local bus system can be, the Straphangers have announced that the M79, with averages speeds of 3.2 miles per hour, is the city’s slowest bus route. The local M15 — subject of many complaints in the post-Select Bus Service era — was named the least reliable with 33% of buses arriving in pairs or worse. Outside of Manhattan’s congested streets, Flatbush Avenue’s B41, the Bronx’s Bx19, Queen’s Q58, and Staten Island’s S48/98 were named the slowest in their respective boroughs, though the latter two attained speeds of at or over 8 mph. The Straphangers have released a full table of their 34 surveyed routes, and the top ten are all in Manhattan. So what happens next? As the Straphangers note, Select Bus Service has improved travel times along those routes that have undergone these upgrades, but as I’ve pointed out again and again, incremental changes such as pre-board fare payment shouldn’t be lauded as much as they are. New York still doesn’t have any true bus rapid transit corridors, and bus lane enforcement is continually under attack by City Council members who prioritize drivers over transit riders. Meanwhile, there is the issue of de Blasio’s 20 bus routes: We’re one year into his administration, and while initial planning is underway, implementation is not exactly around the corner. I’m not holding my breath for 10, let alone 20, and to achieve that goal, de Blasio would have to get seven SBS/BRT routes per year on the streets. For now, local buses remain a blight on the city’s mobility. I can personally attest to the horrible pace (actually the non-existence) of the M79 (W/B)last night. Waited at the first avenue stop for 20 minutes, in the snow, for the bus to come. With each passing moment, my stress just rose knowing that there was a fair chance that the bus would then be packed by the time it arrived and it would move at a snail’s pace hitting subsequent stop full of long lines. I gave in and took a cab costing much more ($11) than I wanted to spend ($2.50). It was 6:20 PM, the tail end of rush hour, in crappy weather. C’mon MTA…step up your game if not your compassion. Specific to the M79, I think a select service system (though keeping the stops the same) would greatly benefit that route given the usual long lines. Its almost unclear if the local M15 even exists anymore a lot of the time. Last I went to ride it I watched 4 M15-SBS buses go by and then walked to the next stop and caught the 5th. The M15 local or SBS have a bus lane in rush hours on Second Avenue where priority is given to parked Coca Cola delivery trucks. If the city agency’s cannot coordinate enforcement why have bus lanes at all? The BRT problem is easy enough to fix, but fixing it requires violating a cardinal masturbatory fantasy of the buses-for-thee-subways/cars-for-me crowd: acknowledge that buses don’t work well in mixed traffic, even when the mixed traffic is only other buses with different stopping patterns, and give locals and expresses separate lanes. Preferably each would have a dedicated lane, but an express bus all but needs a dedicated lane. I have experienced Mexico City’s MetroBus System and I think it works great. I don’t understand how councilpersons can listen to car owners when must people take mass transit. The city needs to impose permits to park in the city or pay a huge parking tax for people who feel too cool to take public transit. Thank God for the MTA Bus tracker App. With this I can see just how far away the next flock of buses on my route are. It really helps in that I can make snap decisions on changing my route, or just plain walk. A couple weeks ago I was waiting at Lincoln Center for the M66–normally one of the more reliable routes. I could see on my App that the next bus was still on the East Side, but knowing its location made the 20 minute wait more bearable. But once it reached the end of its run at West End Ave., it just sat there, and sat there and sat for another 15 minutes, while the next two buses behind it caught up to it! By the time it resumed its run and made it to Lincoln Ctr. my wait was nearly 40 minutes. (The time was now 8:30 P.M. on a weeknight). There seems to be a real problem with the complete inability to dispatch buses with any sort of regular intervals, and hence the inevitable bunching. If I can now see exactly where all the buses are on my cellphone, then can’t there be some supervisor/dispatcher who can do the same, react when there’s a real backlog, and perhaps radio a bus to express past some stops to put some distance between it and the bus behind it and catch up? New York hasn’t been serious about cross-town mass transit since the streetcars were abolished. The bus system is a joke, because – and this is proof that at the end of the day NY is still an American city – preference is always given to cars. Even the Express Buses are hamstrung by lousy bus-lane enforcement & lack of traffic light priority. 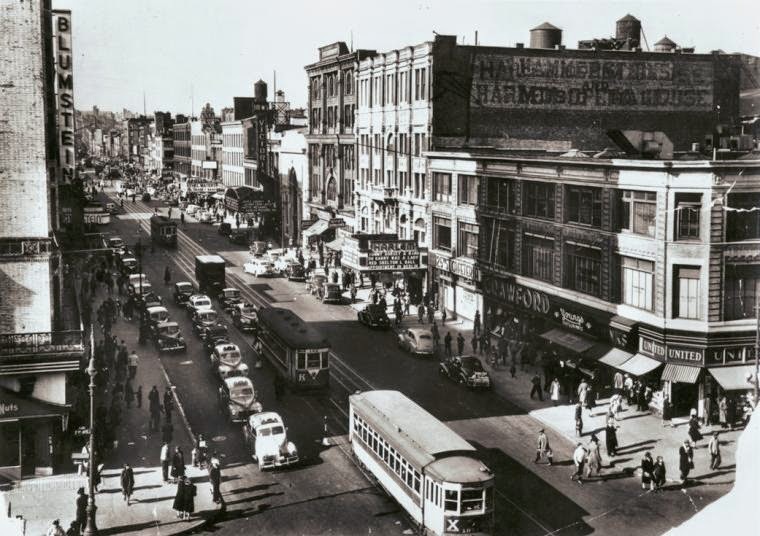 The scheme to put a tram line on 42nd Street with a dedicated right-of-way never went anywhere and never will. DeBlasio talks more about abolishing horse-drawn carriages than he does about mass transit. The Straphangers have been issuing this report for years. Nothing ever changes. Would be interesting to see streetcar schedules/headways to compare to the current bus schedules. How much quicker were these streetcars on 125th St than the M60 SBS today? Of course today we’d never tolerate center-running transit that has passengers simply exit on to the street and find their way past roaring auto traffic. At this point, Flatbush Avenue is a joke. Vehicular traffic is atrocious — especially near Downtown Brooklyn — and the way the lines have been painted along some stretches in conjunction with the slightly narrower space really isn’t conducive to good traffic flow. There’s double-parking galore (which isn’t even dealt with most of the time), idiots jaywalking across (again, not dealt with most of the time), drivers who drive like idiots in other manners, a serious competition for road space which both buses and delivery trucks have to put up with, and the evil of poorly-timed traffic lights (save for any of the ones with all-ways cross intersections for pedestrians). How about just cancelling general service buses that go nowhere. If the bus is blazing along at 3mph, cancel it. Replace with a disabled-only van making flag stops (flag via phone app) every avenue plus regular stops on, eh, 2nd 5th and 8th. With the millions the city wastes on crony accounts of one or another type — we have a chief of staff for the Mayor’s wife — there’s enough to dig a hole under a couple crosstown streets and put in a bus/truck tunnel, which could later have rails in it. With a cut/cover (mind the sewer lines, whoops!) dig there can be plenty of space reserved electrics etc. Other than some express routes, what routes are those? Frequency might be tweakable, but most NYCTA bus routes seem to have thousands of users a day. I see a few routes that get hundreds of users a day, most of them seem to be recently restored from the Walder cuts, but even then I’m hesitant to just declare them “useless” without understanding what they do, who uses them, and why. Part of the reason why buses are prone to crawling has to do with the scheduling. If a bus is supposed to have a specific running time, it’s not supposed to finish a (leg of a) run faster than that. I’m pretty sure that’s the main reason why the M50 crawls. The uptown crosstown lines (M79, M86, M96, M116) could all benefit from SBS improvements, as those are vital east/west corridors with no alternate travel options. they could double or even triple the speed of all the crosstown buses tomorrow if they just eliminated the farebox. Make them free. Half the people are using a free transfer and 25% are seniors paying the half-fare in coins. Has anyone done an analysis if the amount collected on these routes is even worth the trouble time it takes to collect the fares? Forget about the traffic, most of the delay is in loading the bus at each stop. As an anecdote, I took the M34 SBS everyday roundtrip for a few weeks last year and the westbound bus is stopped most of the time at Park for 10 min or so to check tickets on over-packed buses. There is a coffee shop that serves as hq for the enforcement agents. Does the cost and delay of the enforcement justify the service interruption? It might save a few runs an hour, but I doubt it would double the number of buses round trips that easily. I only encountered enforcement once (on the M15), but it sounds to me like they do it way wrong. Just randomly check people and ticket those who don’t have tickets. Checking a whole bus is wasteful. I was only checked once on a SBS line – the 12 out of Bay Plaza. Several times I rode without a slip from BP to Fordham & 3rd & nothing happened. It left me with several nagging questions – regarding the whole point of fare enforcement on these SBS routes. I see the same thing on the HBLR as well.